Albatross: A third-level service award to recognize individuals who take on the same job year after year, and do it with exemplary skill, dedication, and team-work. Briar: A second-level service award given to recognize consistent, outstanding service to the barony. Flamme d’Or: Second level A&S award for the Barony of Blatha an Oir. 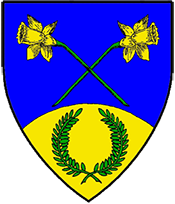 Golden Blossom: Given as a first-level award to recognize service to the barony. Golden Bloom: A Youth (12-17) service award, given to recognize exceptional and consistent service and achievement, to those who through their actions serve as an example to other youth of the barony. Golden Bud: A Children’s (11 and younger) service award, given to recognize exceptional and consistent service and achievement, to those who through their actions serve as an example to other children of the barony. L’Ordre du Gaunt d’Or: Given to those who best exemplify the very essence of our Society, and who have made an exceptional and lasting contribution to every aspect of the barony. La Lis Vert: Given to recognize outstanding achievement in historical research and persona development. Order of The Golden Spear: Given to recognize outstanding achievement in the martial arts in defense of the Barony on the warfield and in the tournament arena: specifically, heavy (hardsuit) fighting. Order of The Golden Blade: Given to recognize outstanding achievement in the martial arts in defense of the Barony on the warfield and in the tournament arena: specifically, rapier fighting. Order of The Golden Arrow: Given to recognize outstanding achievement in the martial arts in defense of the Barony on the warfield and in the tournament arena: specifically, archery. Panther’s Torch: Given as a first-level award to honor and recognize merit in the Arts & Sciences. It is inspired by the device of Blatha An Oir’s founding Baroness, Dame Rowan. Silver Falcon: Individual achievement award for excellence and service to the Barony in the art & science of working with metal. Triquetra: Given to households in recognition of exceptional and continuing service to the barony.